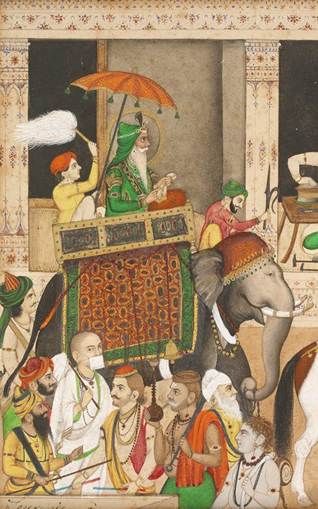 Above: detail from a painting showing the Emperor of Punjab, Maharaja Ranjit Singh on a 'swaree' through the bazaars of Lahore. THE RESOURCEFUL FAKIRS: THREE MUSLIM BROTHERS AT THE SIKH COURT OF LAHORE, by Fakir S. Aijazuddin (Three Rivers Publishers, New Delhi, 2014) is sikhchic.com‘s Book of The Month for March 2014. As the procession of the returning mission made its way down from Simla, Azizuddin, in his howdah atop his swaying elephant, must have pondered on the good fortune that had taken him from humble origins in the old city of Lahore to the cold climes of Simla, from an apprenticeship as a hakim to becoming the spokesman of the Sikh Darbar, invited by the British Lat (Lord) Sahib to sit on a chair on a par with him. Over the years Azizuddin had learned from experience that the way up was always arduous and fraught with perils; the way down was precipitous and dangerous and could be -- if one was not watchful -- fatal. Whatever anxieties Fakir Azizuddin may have felt on that return journey to Lahore, he wisely kept to himself. If he did share them, he would have done so, as he did the wealth they had amassed, with the only two persons he could trust implicitly: his brothers. Azizuddin knew that of the three of them, Imamuddin was now the most vulnerable. Ranjit Singh had entrusted him with a sensitive assignment, to act as custodian of his treasury and arsenal at Gobindgarh Fort. Large sums of bullion, mainly in coins, moved in and out of his custody; prized jewels were bought to be given away as gifts or received as nazar, stored, and individually accounted for; the cannons, the guns and muskets, their shells and shot and other ammunition, the swords and lances had to be counted and kept available for use at short notice. The inventory was endless, the accountability borderless and unlimited. Over the years, Imamuddin had worked with Misr Beli Ram (the keeper of the toshakhana at Lahore) and particularly with his brother Sukh Raj who had been posted at Gobindgarh Fort. Suddenly Beli Ram had fallen victim to the wrath of Raja Dhian Singh [the Hindu Dogra also serving in Ranjit Singh’s Court]. How long would it be, Azizuddin must have wondered, before Dhian Singh picked on Imamuddin? Azizuddin knew that his brother did not enjoy the protection Misr Beli Ram did. Beli Ram was a Brahmin by caste, which is why his life had been spared by Naunihal Singh. Imamuddin’s religion could not provide him such a shield. By comparison, Nuruddin’s duties as a chamberlain were less critical. His was the first face visitors to the court saw, the darbar equivalent of the reception desk at a modern five-star hotel. For nigh on 20 years, since that visit in 1820 by the horse doctor William Moorcroft, Nuruddin had welcomed shoals of visitors, offered them zeafut, supervised the timely supply of provisions to their camps, fulfilled their every need, satisfied their every whim. Nuruddin’s assignment -- repetitive, physically demanding, and not ungratifying -- was not the sort of job a Sikh sardar would covet. Azizuddin’s own position in the altered configuration at the Sikh court would depend on the quality of relations between his masters, the Sikhs, and his friends, the British. The letter of personal approbation sent by Lord Auckland to Azizuddin may have been unique in the annals of Sikh diplomatic correspondence but it was hardly the sort of talisman that Azizuddin could rely on to protect himself from the enemies who would attack him now that his benefactor was dead. Although Azizuddin would have resented the inordinate, pernicious influence Mungal Singh and his associate Chet Singh exercised over Maharaja Kharak Singh, he knew that by the murder of Chet Singh [at the hands of the Dogra brothers], a sinister elemental force, violence, had been unleashed in court politics. The only weapons Azizuddin possessed were of a different caliber: the force of argument, the power of persuasion, the weight of wisdom. That armory was ineffectual now. The main apologists -- Kunwar Partap Singh and Raja Dhian Singh -- arrived at Ferozepur. Partap Singh, an 11-year-old juvenile, had been recalled from Peshawar where he was nominally in charge of the Sikh troops billeted there. The Sikh delegation was invited by Ellenborough to witness the grand military review organized by him in honor of the returning army. The site had been chosen deliberately, because it was the same dusty plain from where his predecessor, Lord Auckland, had bid godspeed to Gen. Willoughby Cotton and his component of the Army of the Indus four years earlier. His Lordship went slightly overboard in his enthusiasm when arranging the parade, insisting, for example, that he would personally supervise the trunks of the elephants to be used in the victory parade and on designing the ceremonial arch through which the army would pass. It took time for 22,500 men and 102 pieces of cannon to pass through those arches. “The young prince, more taken up with his fine ornaments and jewels than with what was passing around him, began to get tired, and twice sent a message to Dheean Singh, requesting permission to change a horse for an elephant; but his request was very positively denied,” it was recorded. Ellenborough returned the visit on January 2. The customary darbar was held in the Sikh camp, during which presents for Queen Victoria -- “a perfectly beautiful green Kashmir tent, embroidered with silk” and a portrait of Ranjit Singh by a local artist -- were formally handed over. Gifts were given to each senior attendee. With this, too, the old Fakir was busying himself, holding a long list in his hand, and reading aloud the names of those who were so fortunate as to be entitled to receive them. The gentlemen about Lord Ellenborough and General Sale next received each a handsome saber. After the presentations, the 5,000 troops who had accompanied Kunwar Partab Singh were reviewed by Ellenborough. To show that the slight which had necessitated this costly apology had been forgiven, Ellenborough invited the young prince to sit with him in his howdah. Raja Hira Singh reached Lahore before the others did. He called on Maharaja Sher Singh and gave him an account of his meeting with the governor-general. Later that afternoon, Raja Partab Singh and Raja Dhian Singh came and during the journey to Shalimar Gardens with the Maharaja narrated details of their reception at Ferozepur. Fakir Azizuddin, in many ways the person who had single-handedly retrieved what could have been a diplomatic disaster, was the last to arrive. Azizuddin’s contribution received a compliment from Ellenborough, who described him as “a well-wisher of India and Lahore.” Nuruddin repeated this to Henry Lawrence years later -- and presented him with a gold watch. Ellenborough was also told, and in turn told Queen Victoria, that a grateful Sher Singh had granted lands to Azizuddin. Azizuddin was a man of words, not weapons. The closest he had been to a sword was when he had been accidentally injured by Dewan Bishan Singh at a darbar a few years earlier. He had “no fancy in his old age for bayonet thrusts from rude Sikhs,” it was said. Nearing the age of 65, Azizuddin would have preferred to retire quietly with dignity and to spend his remaining days composing poetry in the Sufi tradition. But the choice was not his to make. Honor and dishonor, Azizuddin knew, lay in the hands of the Almighty. Azizuddin had received honor beyond the limits of his imagination; in the final years of his life, he was to experience its inversion. Immediately, Azizuddin, Nuruddin, and Bhai Ram Singh were summoned to appear before them. These three confirmed that everything Broadfoot had said in his letter was “in conformity with justice and with the treaties.” They advised that an unqualified submission would be the only course of action that would not threaten the alliance. Both brothers refused to “have anything to do with the preparation of any letters defending the conduct of the Durbar.” The Fakirs were consulted again and maintained their recommendation that “an apology and dismissal of the Sowars” was necessary. Azizuddin could see that in such chaotic and turbulent conditions a sure hand was required at the wheel of state. His preference was for Gulab Singh. There could have been no better example of this diversionary tactic than during Azizuddin’s final appearance at the Darbar in September 1845. The Darbar had decided that the British, by not permitting Sikh troops to go unhindered across the Sutlej, had exceeded the bounds of hospitality. They proposed to send a letter to remind them that the Darbar had at great cost twice invaded Afghanistan for the benefit of the British; that English armies had traversed the Punjab to the detriment of its people and government, an injury which had been patiently borne by the Darbar; that [the British] had been permitted to occupy Ferozepur, which by right belonged to the Darbar, on condition of keeping no more troops there than were necessary for the management of the district, but that in spite of this a great army was collected. Both Bhai Ram Singh and Azizuddin were summoned to appear in person before the Darbar. Bhai Ram Singh refused; Azizuddin thought it more politic to obey. The Fakir, more at the mercy of the Darbar, attended. And, after a scene almost comical, gave an ambiguous approval understood by the intelligent, but taken literally by Jawahir Singh and his companions. He declared the style and composition to be admirable and calculated to fill the English with terror; that in his day such a letter would not have been answered, for Ranjit Singh had to deal with Sir D. Ochterlony and other headstrong men; but that he had no doubt the change was as great on the south as on the north side of the Sutlej, and if so the parwana would produce the desired effect. He flattered them with such great ability that he obtained Rs. 500 as a present, the promise of a jagir, and, what he valued more, the promise of never being sent for again on such a matter. On taking leave he said, so strong was habit at his years, that greatly as he admired the parwana and the spirit that dictated it, he could not help advising as most favorable to tranquility, adherence to the old treaty, and established rules. This appearance was to be Azizuddin’s swansong. He withdrew completely into the protective privacy of his haveli, and safe within its walls he withdrew within himself, devoting his time to contemplation and poesy. Alone but not lonely, Fakir Nuruddin had little time to himself to ponder over his situation. If he had earlier been an instrument in the hands of Ranjit Singh, he had to be careful now not to become too overt a tool in the hands of the British. His position as a Muslim, in a sense already the senior most Muslim in the Punjab, had not yet matured into the role that he would occupy once the British had absorbed the Punjab completely. He remained noncommittal during a discussion on the oscillating policy within the Darbar on the disturbed territory of Hazara -- much to Henry Lawrence’s annoyance, they would agree on a thing one day and renege the next day -- and prudently silent when he received a roobakaree or order permitting Muslims throughout the kingdom to cry their calls to prayer and abolishing all religious restrictions except the killing of kine. “Fuqueer Noorooddeen left us at Meerut on 22nd instant on his return to Lahore. He marches via Saharanpur and Umballa to Ferozepore. I take this opportunity of the Fuqueer’s departure to mention to you that as far as his demeanor towards myself is concerned, I found him all that could be wished, but in the presence of the Maharanee, he was in the habit of evincing a degree of timidity and hesitation in addressing Her Highness, and especially on those occasions when I had to communicate some instructions for her unveiling, for which I was a long time unable to assign a cause. “I believe now from what the Fuqueer let fall before his departure that this nervousness was occasioned by the fear that his position with the Maharanee might be misrepresented, and that he would incur obloquy at Lahore as being the willing custodian instead of a mere channel of communication between the Ranee and myself.